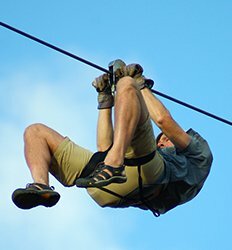 Zip lining has been around for many years and was originally designed as a means of transportation. 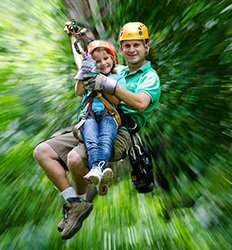 Costa Rica, known for gigantic trees in the Northern Arenal region, has mastered this form of transport and is one of the world’s leaders in Canopy Tours. For those looking for an adrenalin rush, Canyoneering is the newest sport hitting the eco-tourism market! The Real Deal Tours offers exciting combos for both Canopy and Pure Trek Canyonings. 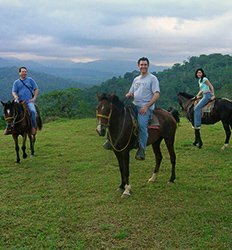 These great combo tours involve soaring across Costa Rica’s finest rainforest where monkeys and sloths hang out. 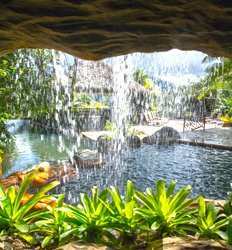 Rappel down 150ft magical waterfalls while taking in an aerial view of the famed Arenal volcano! 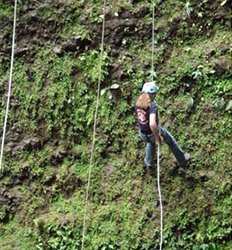 Arenal Canopy, Canyoning, and Rappel tours offer a once in a lifetime experience!! If you are an adventurist but not in an extreme sense, The Real Deal Tours also offers exciting combos the entire family can enjoy. Check out all of our Canopy, Canyoning and Rappelling Tour options and turn your eco-vacation into a memorable one! 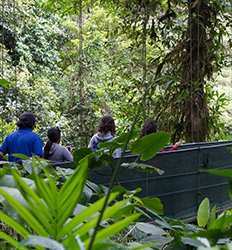 Just outside of La Fortuna at the Los Lagos Resort you will find our Los Cañones Canopy tour in Arenal. 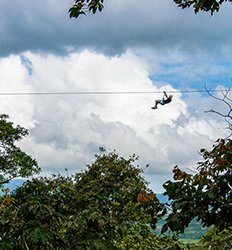 Unlike other canopy tours in Costa Rica, we make sure to take care of you after zip lining with free access to our hot springs and pools that even include water slides both children and adults will love! Costa Rica is a leader in ecotourism and our canyoneering tour in Arenal is one of the top eco tours in Costa Rica. There´s nothing more adrenaline-pumping than rappelling down a rock face into a waterfall, right? 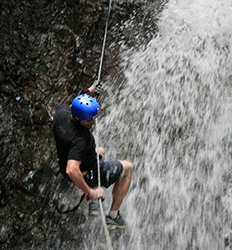 On this Arenal canyoning excursion you´ll rappel down three waterfalls. If you like being up high in the trees, it´s your lucky day, because now you can combine two of our most popular tours into one super fun day, with the Arenal Sky Tram and Sky Walk adventure! 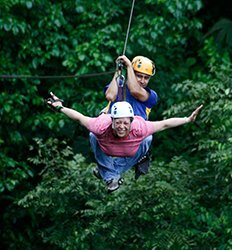 Experience the ultimate in zip line fun on the Sky Trek...it´s not a canopy tour, it´s so much more! If you like being up high in the trees, it´s your lucky day, because now you can combine two of our most popular tours into one super fun day, with the Arenal Sky Tram & Sky Trek adventure! Experience the ultimate in zip line fun on the Sky Trek… it´s not a canopy tour, it´s so much more! Spend your day high in the trees on this fun 3-part excursion, gliding, zipping and ambling your way through Arenal´s rainforest canopy. It´s an open air gondola which glides on cables high up the mountainside to a viewpoint of Lake Arenal & the Arenal volcano like none you´ve ever seen before! Not quite ready for waterfall rappelling? How about just a taste of it at the climbing and rappelling wall at The Springs Resort’s Club Rio? 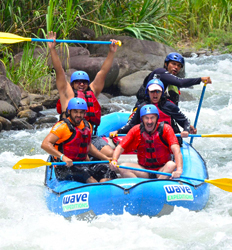 Better yet, you can combine your climbing and rappel adventure with another activity such as tubing or kayaking the Arenal River. Top that off with a soak in the springs and you have a full day of adventure!